Zephaniah, one of the prophets of Judah, wrote this bible book that bears his name. His name means "Yahweh hides", "hidden by Yahweh", "he whom the Lord has hidden", or "Yahweh protects". <!-black-> What are some things that we know about Zephaniah? Zephaniah appears to claim that King Hezekiah of Judah was one of his ancestors. Why did he do that? Maybe it gave him credibility. On the other hand, maybe it was a way to get the attention of the King of Judah and his princes who ruled the land. They had the power to institute change for the better. Since he was a prince of the royal house of Judah (of the royal lineage) and possibly an aristocrat, then the king and princes might be more favorably inclined to listen to what he had to prophesy. Did they listen? I am inclined to say yes. There was a large revival under King Josiah. I like this king and I have his name as my middle name. Later kings and princes of Judah may have disregarded his prophesy but it still stood true whether they believed it or not. That is why it was added to the Jewish canon of scripture. He may have known the prophets Jeremiah, Nahum, and Habakkuk. This bible book was written sometime during the reign of King Josiah, about (641-610 B.C.). It was written from somewhere in the Kingdom of Judah, possibly from Jerusalem. Deuteronomy chapters 28 through 30. The nation of Israel had been divided into the northern Kingdom of Israel and the southern Kingdom of Judah. 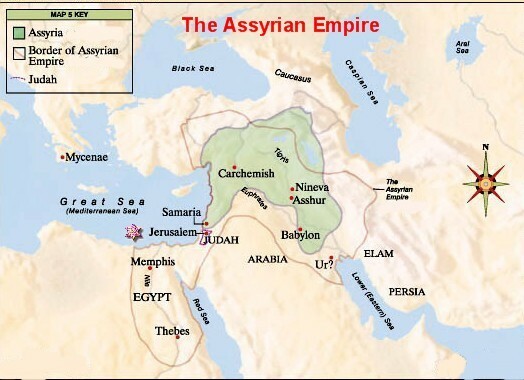 Folks in the northern Kingdom of Israel had already been deported to Assyria as slaves many years before for its sins. 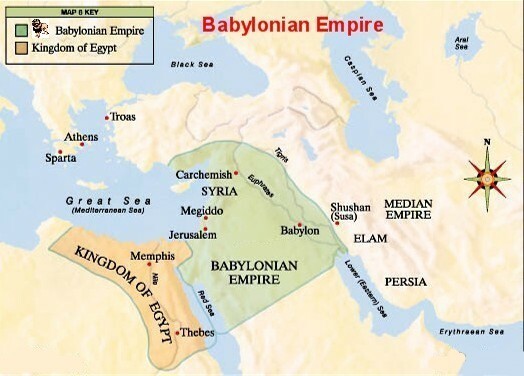 Now, it appears that the Babylonians are going to deport the folks of the southern Kingdom of Judah for its sins. Zephaniah's message is that, not only Judah, but also its 5 hostile neighbor nations all deserve to be deported (suffer God's judgment) due to their sins. Did this happen? Yes. It happened just as God through the prophet, Zephaniah, said it would. In the end times, it appears, these events will happen again only on a world-wide scale. The Battle of Armageddon, during the Day of the Lord, will be fought, and then Jesus Christ will rule from Jerusalem as the rightful Jewish Messiah and will institute universal peace. Then there will be a time of fruitfulness and Kingdom blessing. disobedient individuals and nations for their sins. obedient individuals and nations who obey Him. Jesus Christ is known as Our jealous Lord. The word jealousy occurs twice in this bible book. <!-purple-> "...the whole land shall be devoured by the fire of His jealousy..."
<!-black-> Why should God be jealous? He is jealous when anyone He owns is enslaved by sin and sin becomes his or her new master. Let us take a quick look at Baal worship and see why God hated it so much. Baal worship was a false religion to a false god in the form of an idol. The word "Baal" is spelled the same in the Hebrew language. The name means "master" or "owner". Because Satan received worship through this Phoenician idol god, the meaning of Baal can be interpreted as "Satan is my master or owner". The worship from God's people should go to God alone, not to Satan. When our worship goes to Satan, God is our jealous God. Who owns you- God or Satan? "Grace will save a man but it will not save him and his idol"
<!-red-> "I will sweep away everything in all your land, says the Lord. I will sweep away both people and animals alike. Even the birds of the air and the fish in the sea will die. I will reduce the wicked to heaps of rubble, along with the rest of humanity, says the Lord. I will crush Judah and Jerusalem with My fist and destroy every last trace of their Baal worship. I will put an end to all the idolatrous priests, so that even the memory of them will disappear. For they go up to their roofs and bow to the sun, moon, and stars. They claim to follow the Lord, but then they worship Molech, too. So now I will destroy them! And I will destroy those who used to worship Me but now no longer do. They no longer ask for the Lord's guidance or seek My blessings"
<!-black-> Is any of this relevant for our time? I believe it is. Why? Because of human depravity and the activity of Satan and his demons, the pull is always downwards. That means that folks might actually stoop that low again in our near future. It was not the end of the physical world in their time but it was the end of their world as they knew it. A neighbor of mine had a house burn to the ground. I asked him if there was anything left standing. He indicated that everything that used to be there was now as level as the ground. God is indicating through His prophet, Zephaniah, that He is going to level the land of Judah. Why? It was because of their sins. And then He will take it a step further- he will level the entire earth, at a future time, for the same reason. When will this happen? It will happen during the Day of the Lord, during the Great Tribulation Period of time right before the Millennial Reign of Christ. But during His Millennial Reign, Christ will renew this earth to a better condition. <!-red-> "I will stretch out My hand against Judah, and against all the inhabitants of Jerusalem. I will cut off every trace of Baal from this place..."
<!-red-> "...Those who worship and swear oaths by the Lord but who also swear by (the idol-god) Milcom..."
<!-black-> This idea of worshipping God and Satan at the same time came from the pagan folks who were brought to Samaria by the King of Assyria after the folks from the northern Kingdom of Israel were deported. It is sad to think that the religion of these pagans infiltrated so deeply into the true worship of God in Judah to corrupt it- but it did happen over a period of about 150 years. Who were the Samaritans and where did they come from? <!-purple-> "Therefore be very courageous to keep and to do all that is written in the Book of the Law of Moses, lest you turn aside from it to the right hand or to the left, and lest you go among these nations, these who remain among you. You shall not make mention of the name of their gods, nor cause anyone to swear by them- you shall not serve them nor bow down to them, but you shall hold fast to the Lord your God, as you have done to this day"
<!-red-> "Those who have turned back from following the Lord, and have not sought the Lord, nor inquired of Him..."
<!-black-> These excuses pretty much come from all of the ones who have made the wrong choices NOT to love the Lord nor be obedient to Him- the backsliders from the faith, the atheists, the agnostics, the idol worshippers, the satanists, the ones who decided to completely ignore Him and His commandments, and others. <!-red-> "And it shall be, in the day of the Lord's sacrifice, that I will punish the princes and the king's children, and all such as are "clothed with foreign apparel"
<!-black-> "Clothed with foreign apparel or strange clothes" is an expression that means "accepted the ways of the idol worshippers." This expression refers to a sinful lifestyle, not just an act of wearing clothes. <!-red-> "In the same day I will punish all those who leap over the threshold, who fill their masters' houses with violence and deceit"
<!-black-> A worshipper who entered the temple of Dagon, the idol god of the Philistines, had to jump over the threshold in order to enter. Their sinful actions of violence and deceit matched their worship of Satan through this idol. <!-red-> "...you inhabitants of Maktesh..."
<!-black-> The word "Maktesh" is another name for Jerusalem. If their rebellion was rampant in their capital city, then it was also rampant in all the nation. <!-purple-> "That terrible Day of the Lord is near. Swiftly it comes- a day when strong men will cry bitterly. It is a day when the Lord's anger will be poured out. It is a day of terrible distress and anguish, a day of ruin and desolation, a day of darkness and gloom, of clouds, blackness, trumpet calls, and battle cries. Down go the walled cities and strongest battlements! Because you have sinned against the Lord..."
<!-black-> I believe that one can mis-judge the facts in any action but what is the intent of the heart of the individual? What is the intent of God's heart in bringing judgment? Is it to kill, hurt, and destroy? No. That is the intent of Satan's heart. The intent of God's heart is correction for wrong doing, however, there are times when He will destroy but that is not His nature to do so. I believe that the Day of the Lord will be one of those times. In the future, the world will have declared war on Him and as a righteous consequence, He will destroy the armies of the antichrist in order to bring universal peace and unity into full blossom. Every once in awhile a large forest will catch fire. To some folks this is a horrible tragedy and a terrible waste. Sometimes the judgment of God is looked upon in a negative way also. But the forest will be better off to some degree after the fire. Why? Because the brush that chokes off the sunlight is removed. This allows fresh life to now come to the forest. God is a God of justice, holiness, and love. Even in judgment God is still a God of love. God has to be true to Himself. God cannot be true to you or I unless He is true to Himself first. He judges sin in your life and my life, He judges sin in the nation in which we live, He judges sin in the world, and He is going to remove sin from the universe in the future. And He is a God of love even when He does that. And after His judgment in those days there is going to spring up new spiritual life for all to enjoy. <!-black-> On a personal level, you or I do not ever want to be in the position where God is against us. Have you ever seen a wild horse that someone wanted to ride on? That horse has "to be broken" first before anyone can ride it. If we are against God, God may have to "break us" before we will turn to Him so He can use us. He has to get us to the point where we will submit our will to His. If we do not submit then judgment may come our way. However, if radical and severe surgery against sin is the only option on the table, so to speak, then God may be forced to use it in order to save us. And God is big enough and powerful enough to do that. But He does it in love and for our good. Luke 21:35-36; 2 Peter 3:10-13. <!-purple-> "Gather together and pray, you shameless nation. Gather while there is still time, before judgment begins and your opportunity is blown away like chaff. Act now, before the fierce fury of the Lord falls and the terrible day of the Lord's anger begins"
<!-red-> "O Israel, My faithless people, come home to Me again, for I AM merciful. I will not be angry with you forever. Only acknowledge your guilt. Admit that you rebelled against the Lord your God and committed (spiritual) adultery against Him by worshiping idols under every green tree. Confess that you refused to follow Me..."
<!-purple-> "Who can stand before His indignation? And who can endure the fierceness of His anger? His fury is poured out like fire, and the rocks are thrown down by Him. The Lord is good, a stronghold in the day of trouble; And He knows those who trust in Him"
<!-purple-> "Seek the Lord, all you meek of the earth, who have upheld His justice. Seek righteousness, seek humility. It may be that you will be hidden in the day of the Lord's anger"
<!-black-> From my studies of the holy scriptures, it appears (in relation to major judgment) that God deals with a remnant- those folks who love God and are true to God. Those true believers are devoid of selfishness, pride, self-sufficiency, and any kind of worship of the devil. In comparison to numbers, those folks are always in the minority. Why? Because God deals with quality rather than with quantity. Sometimes in college, a professor will grade on the curve method- comparing your score against others in the same class. Christ grades on the cross, not on the curve. <!-black-> He deals with a remnant for their holiness and survival. His dealings with them (them going into captivity) will ultimately be for their good and not for evil. <!-purple-> "You cause judgment to be heard from Heaven; the earth feared and was still, when God arose to judgment, to save all the meek of the earth"
<!-red-> "Now, as surely as I live, says the Lord Almighty, the God of Israel, Moab and Ammon will be destroyed as completely as Sodom and Gomorrah. Their land will become a place of stinging nettles, salt pits, and eternal desolation. Those of my people who are left will plunder them and take their land." <!-purple-> "They will receive the wages of their pride, for they have scoffed at the people of the Lord Almighty. The Lord will terrify them as He destroys all the gods in the land. Then people from nations around the world will worship the Lord, each in their own land"
<!-purple-> "Now Mesha king of Moab was a sheepbreeder, and he regularly paid the king of Israel one hundred thousand lambs and the wool of one hundred thousand rams. But it happened, when Ahab died, that the king of Moab rebelled against the king of Israel"
<!-black-> This passage of scripture is proved by archaeology. How? Because there is a "Moabite Stone" that was found in Moab. What is it? It is a large stone that is inscribed. It is four feet high, two feet wide, and fourteen inches thick. It was discovered (in Moab) in 1868 in the city of Diban. A part of the inscription reads: "I Mesha, King of Moab, made this monument to Chemosh [god of Moab] to commemorate my deliverance from Israel...[from] Omri, King of Israel, [who] oppressed Moab and his son [Ahab] after him. I warred against their cities, devoted the spoil to Chemosh, and in Beth-Diblathaim sheep raisers I placed." <!-black-> Moab and Ammon were the two sons of Lot (Abraham's nephew). 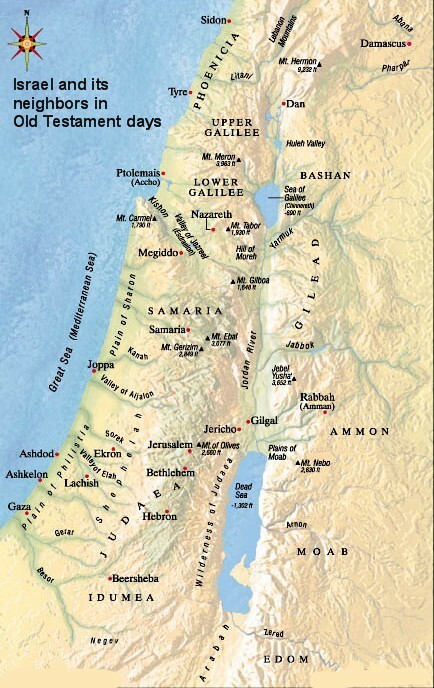 Their descendants were neighbors of the descendants of Isaac (Abraham's son). In other words, the nations of Moab and Ammon were near the borders of the nation of Israel and they were headed for destruction. Did destruction come upon them? Yes. These nations were totally destroyed about 582 B.C. by Babylonian King Nebuchadnezzar when he marched his army there- possibly in retaliation for their part in the murder of his regional governor, Gedaliah. You won't find these nations in existence today. <!-purple-> "Its leaders are like roaring lions hunting for their victims- out for everything they can get. Its judges are like ravenous wolves at evening time, who by dawn have left no trace of their prey. Its prophets are arrogant liars seeking their own gain. Its priests defile the Temple by disobeying God's laws. But the Lord is still there in the city, and He does no wrong. Day by day His justice is more evident, but no one takes notice- the wicked know no shame"
<!-red-> "For both prophet and priest are profane; Yes, in My house I have found their wickedness, says the Lord... And I have seen folly in the prophets of Samaria: they prophesied by Baal and caused My people Israel to err. Also I have seen a horrible thing in the prophets of Jerusalem: they commit adultery and walk in lies..."
<!-red-> "Her priests have violated My law and profaned My holy things- they have not distinguished between the holy and unholy, nor have they made known the difference between the unclean and the clean; and they have hidden their eyes from My Sabbaths, so that I am profaned among them"
<!-purple-> "The time of Israel's punishment has come; the day of payment is almost here. Soon Israel will know this all too well. "The prophets are crazy!" the people shout. "The inspired men are mad!" so they taunt, for the nation is burdened with sin and shows only hatred for those who love God"
<!-black-> God is not going to do evil- He is holy. But some religious leaders who say they are following God are not- rather, they are doing evil. When these kinds of folks do evil in God's name and God does nothing, it appears as if God approves of that sort of thing. Nothing could be farther from the truth. God continues to be good while the unjust continue on in sin with no shame at all that it is public knowledge. <!-red-> "On that day I will purify the lips of all people, so that everyone will be able to worship the Lord together"
<!-black-> Sinful flesh has a hard time of being elevated when in the presence of the holiness of the Lord of Lords and King of Kings. <!-purple-> "Then I said: my destruction is sealed, for I am a sinful man and a member of a sinful race. Yet I have seen the King, the Lord Almighty! Then one of the seraphim flew over to the altar, and he picked up a burning coal with a pair of tongs. He touched my lips with it and said, See, this coal has touched your lips. Now your guilt is removed, and your sins are forgiven"
<!-purple-> "...Simon Peter...fell down at Jesus' knees, saying, depart from me, for I am a sinful man, O Lord!" Zechariah 8:3 & 16. The Abrahamic covenant from God finds its final fulfillment in the Messiah's Kingdom Blessings in the last days. What was the Abrahamic covenant? <!-red-> "Then the Lord told Abram, leave your country, your relatives, and your father's house, and go to the land that I will show you. I will cause you to become the father of a great nation. I will bless you and make you famous, and I will make you a blessing to others. I will bless those who bless you and curse those who curse you. All the families of the earth will be blessed through you"
<!-purple-> "He has cast out your enemy..."
<!-purple-> "The Lord your God in your midst, the Mighty One, will save; He will rejoice over you with gladness, He will quiet you with His love, He will rejoice over you with singing"
<!-black-> God usually deals with two different kinds of judgment mentioned in the holy bible. 1) The first kind of judgment is when God corrects His own people. This is what we call "corrective punishment or chastisement". This is when God acts as a Father and disciplines us as disobedient children when we show forth bad behavior. <!-purple-> "For the Lord disciplines those He loves, and He punishes those He accepts as His children"
<!-purple-> "For the time has come for judgment to begin at the house of God; and if it begins with us first, what will be the end of those who do not obey the gospel of God?" <!-black-> 2) The second kind of judgment is on unbelievers. There are many examples of this in the bible. This is the kind of judgment that Zephaniah deals with here. The entire population of the earth is moving towards a final destiny that will consummate in a judgment for lost humanity. <!-black-> God is not unnecessarily being harsh or unloving when He moves in judgment. This is where we need to look at the total word of God and keep all judgment passages of scripture in proper perspective. Remember, that God always balances His judgment against His mercy and love. He can be merciful and loving while hating sin and disciplining others in judgment at the same time. Have you ever had an earthly father who disciplined you and loved you at the same time? His discipline may have come from the root of love for you that he had in his heart, and he corrected you for your own good. No good father is going to allow a small child to get into the family medicine cabinet to eat poison pills there. He or she has to be taught to stay out of it. It is for the child's own good. <!-black-> When He gave us the 10 commandments He was not trying to forbid us from doing pleasurable things or being a harsh military commander with a list of regulations of do this or don't do that. Rather He was being a very loving protective Father to you and to I. That is what good fathers do- they love and protect their children. To you or I, these 10 commandments may appear to be legalistic rules, but from God's point of view, He has given them to you and I to help us navigate our pathway through life around the enemy's obstacles to arrive at our ultimate port of destination in safety. <!-black-> Men and women would gather together to worship. Where did they worship? Sometimes they would worship the god, Baal, at "the high places" or "the groves" (of trees). Priests of Baal would conduct the activities. Human babies would be burned alive as a sacrificial offering to this god. There were terrible screams of pain amidst the stench of charred human flesh. There were wild sexual orgies including fornication, adultery, bisexuality, homosexuality, and beastiality. Why did they do it? They wanted this god to produce economic prosperity for them. By these actions they believed that they were prompting Baal to bring rain to bless their crops and to give them other things that they desired. <!-black-> Who were the "Chemarims" mentioned in Zephaniah 1:4? The word "Chemarims" is kamar in the Hebrew language. This word means "idolatrous priests". I doubt if they were much different than the black robed priests of Satan that are around today. <!-black-> Who or what was the god, Malcham, mentioned in Zephaniah 1:4? This word can also be spelled as Milcom. In the Hebrew language, the word is spelled Malkam or Milkowm. The root words, Molek and Melek, mean "Royal King, Molek". In the English language, the word is spelled "Moloch". What do I see here? I see that Satan was getting worship through this god. How? Looking at the name in a little different way, the title might mean "Royal King, Satan". Satan is always trying to make himself a god and trying to get the worship that only belongs to God. <!-black-> The Philistines worshipped Satan through the fish-god, Dagon. Dagon in the Hebrew language is spelled Dagown. Many offerings to this god were gotten by violence, deceit, fraud, and oppression. <!-purple-> "Our god (Dagon) has given us victory over our enemy Samson! ...Then Samson prayed to the Lord: Sovereign Lord, remember me again. O God, please strengthen me one more time so that I may pay back the Philistines for the loss of my eyes. Then Samson put his hands on the center pillars of the temple and pushed against them with all his might. Let me die with the Philistines, he prayed. And the temple crashed down on the Philistine leaders and all the people. So he killed more people when he died than he had during his entire lifetime"
<!-black-> Samson repented in the horrible trial that sin and Satan thrust upon him. In my opinion, God did not like the idea that the Philistines were bragging about their god defeating His servant, Samson. Satan was not going to get the final word in that showdown between one of God's servants and many of Satan's servants. I believe that is why God answered Samson's final prayer and gave him the strength to win the victory. <!-purple-> "After the Philistines captured the Ark of God, they took it from the battleground at Ebenezer to the city of Ashdod. They carried the Ark of God into the temple of Dagon and placed it beside the idol of Dagon. But when the citizens of Ashdod went to see it the next morning, Dagon had fallen with his face to the ground in front of the Ark of the Lord! So they set the idol up again. But the next morning the same thing happened- the idol had fallen face down before the Ark of the Lord again. This time his head and hands had broken off and were lying in the doorway. Only the trunk of his body was left intact. That is why to this day neither the priests of Dagon nor anyone who enters the temple of Dagon will step on its threshold (instead, they have to leap over the threshold)"
<!-purple-> "The people of Samaria tremble in fear at their calf idol at Beth-aven. The people mourn over it, and the priests wail for it, because its glory will be stripped away. This idol they love so much will be carted away with them when they go as captives to Assyria, a gift to the great king there. Israel will be laughed at and shamed because its people have trusted in this idol"
<!-black-> The expression The Day of the Lord is used 7 times in this bible book. Other prophets also used this expression. 3) The battle at the end of the Millennial Reign of Christ. <!-purple-> "That terrible Day of the Lord is near. Swiftly it comes- a day when strong men will cry bitterly. It is a day when the Lord's anger will be poured out. It is a day of terrible distress and anguish, a day of ruin and desolation, a day of darkness and gloom, of clouds, blackness, trumpet calls, and battle cries. Down go the walled cities and strongest battlements! Because you have sinned against the Lord, I will make you as helpless as a blind man searching for a path. Your blood will be poured out into the dust, and your bodies will lie there rotting on the ground. Your silver and gold will be of no use to you on that day of the Lord's anger. For the whole land will be devoured by the fire of His jealousy. He will make a terrifying end of all the people on earth"
1) The imminent Babylonian invasion of Judah, along with all the major nations on the earth (at that time) including Philistia, Ammon, Moab, Ethiopia, and Assyria. This was literally fulfilled about 605-586 B.C. 2) A future invasion of Israel from the armies of the world dictator (the antichrist), and God's judgment on all the nations of the earth. (Isaiah 2:10-22; Joel chapters 1 & 2; Revelation 19:11-21). <!-black-> God is glorified in judging as well as He is glorified in saving. <!-red-> "When My people are living in peace in their land, then you will rouse yourself. You will come from your homeland in the distant north with your vast cavalry and your mighty army, and you will cover the land like a cloud. This will happen in the distant future. I will bring you against My land as everyone watches, and My greatness will be displayed by what happens to you. Then all the nations will know that I am the Lord"
<!-black-> How did all of those people get to all of those lands? <!-purple-> "From these the coastland peoples of the Gentiles were separated into their lands, everyone according to his language, according to their families, into their nations"
<!-red-> "Ashkelon shall see it and fear; Gaza also shall be very sorrowful; And Ekron, for He dried up her expectation. The king shall perish from Gaza, and Ashkelon shall not be inhabited. A mixed race shall settle in Ashdod, and I will cut off the pride of the Philistines. I will take away the blood from his mouth, and the abominations from between his teeth. But he who remains, even he shall be for our God, and shall be like a leader in Judah, and Ekron like a Jebusite"
<!-red-> Thus says the Lord God: "Because the Philistines dealt vengefully and took vengeance with a spiteful heart, to destroy because of the old hatred, therefore thus says the Lord God: I will stretch out My hand against the Philistines, and I will cut off the Cherethites and destroy the remnant of the seacoast. I will execute great vengeance on them with furious rebukes; and they shall know that I am the Lord, when I lay My vengeance upon them"
<!-purple-> "Rejoice not, O Philistia, all of you, that the rod of your striking is broken. For a viper comes forth from the root of a snake, and his fruit shall be a fiery flying serpent. And the first-born of the poor shall feed, and the needy shall lie down in safety; and I will kill your root with famine, and he shall slay your remnant. Howl, O gate! Cry, O city! O Philistia, all of you, are melted away; for from the north a smoke comes, and no straggler in his ranks"
Jeremiah chapter 48; Isaiah 16:6-9. <!-black-> 3) The civilization and cities of the Ethiopians will be destroyed. Nahum chapter 1; Isaiah 10:5-34. <!-black-> Were these nations destroyed as God said He would do to them? Yes. History confirms this fact. <!-black-> Are you dealing with a problem in your life? Maybe you don't think there is any way out? Well, there is, but you and I must be patient. We have to wait for God to do what He has to do. He has to be given time to work out His plan. He calls upon us to be patient. Since God is the source of light- if we get ahead of Him on the trail of life then we will walk in our own shadow. We cannot see where we are going. We might stumble and fall or worse- we might fall over a cliff and perish. Let us be patient and follow behind Him and walk in His light.